Recommendations from this group helped immensely on my settings for baseball last weekend, at least the daytime shots. They came out great. However, struggling with the night shots. I have a new 70-200 2.8 Nikkor lens for my D7500. It has a lot of settings on the lens itself and I haven't gotten much out of the brochure that came with the lens. Any suggestions on the settings (camera/lens). I have been shooting in Manual or shutter priority, at 2.8, auto iso, with a ss at 1,200 to 1,600, sometimes dipping down to 1,000 since the histogram is showing much too dark. I have tried using the exposure compensation from .3 to .7. Still getting really dark pics. Definitely noise, but was hoping to get some settings that would either take care of the noise or the darkness, and thought I could worry about the other in post processing. Usually shooting the third baseman, pitcher or batter. Don't go to shooting the outfield. Thanks in advance. Exposure compensation only affects the metering when in manual mode. It does not change your exposure. Reset it back to 0.0. What is the Maximum ISO setting? You can change that. Also, 1/1000s should be OK. I've used that successfully for Minor league BB. Why 1.4 instead of 2x extender? Can you explain why one would choose a 1.4x extender instead of a 2x extender? Especially if it is a zoom being extended. Is there a huge cost in image quality between the two or are there other reasons? First off, you loose two stops of light with the 2.0X and one stop with the 1.4X. Secondly, the 2.0X also produces softer images. The quality may not be good enough for your needs. You have to decide whether the loss of quality is OK, or not.. I read it has something to do with a communication difference between the AF system (screw drive) and the AF-s / AF-p lenses. I don't think it is brand specific. It won't work with my AF Nikkor 105 micro either. Make sure you turn AF off before image stacking. You may have to be in manual mode also. How important is it to get the "correct exposure"? Many folks here say or imply that getting the "correct" exposure is a must if you want to get good images. Many will add that you have to shoot in "manual" to get control of the camera and get that "correct" exposure. I'm wondering what message this sends to newcomers. Yes, you should try to get the exposure as close to "perfect" in the camera. Yes, there are difficult lighting situations that can cause the camera's light meter to give you readings that may be wrong for what you want. But, let's face it, changing exposure is just a matter of letting in more or less light and/or changing the ISO. The light meters in modern cameras are pretty darn good. And if the lighting is squirrelly, you can make the proper up or down adjustments using exposure compensation if you're in one of the auto modes. And you have a fair amount of control in post-processing, particularly if you're shooting RAW. I don't mean to resuscitate the Manual vs. semi-auto modes debate. I'm just wondering if there is too much of a mystique being attached to getting the "proper" exposure. So how important is it to "nail" the exposure settings? Aren't there more important, or at least equally important considerations such as focus, depth of field, etc.? If you take a look at the last 4 or 5 issues of Professional Photographer Magazine, you will find almost all of the exposures are "under exposed". That is, if you looked at the histogram for these cover shots, you would have almost no whites on the right side. Perhaps the photographer exposed to the right (ETTR) to get the whites almost up against the right side of the histogram and then decreased exposure in post production. That, to me, may be the most sensible way to expose to make sure you have all the detail in the darker tones that you want. Does that make sense? I believe that this is a clip designed to assist in cable management. Each Nikon camera that I have bought has come with one or more of them. This one is a bit more complex design. I've not yet sat down to figure out how to use it. 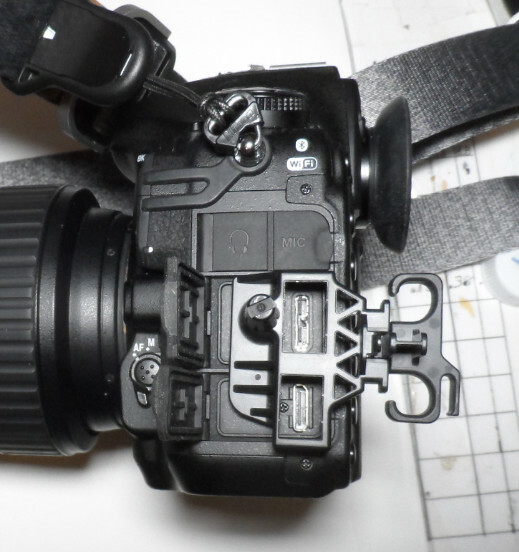 It plugs into the USB port on the side of the camera. Thanks for asking. I never tried before to figure it out. I would use AUTO ISO with a maximum set at about 6400 or 8000. You want a shutter speed of about 1/1000s or faster. Watch videos by Steve Perry. He has some good videos on settings for BIF and nature photography in general. You've been to this show 23 times, and still don't know what equipment works best? I was contacted by a guy who likes my photos, especially the fetish photos with the girl in prison outfits, manhandled, and under duress. And many shots quite explicit. He wants me to do a custom shoot along these themes. The 'custom' aspect would be particular odd clothing and accessories on the girl. He says that although he'd be paying, he's fine with me posting some of the photos. There'd be no post work and he'd like copies of the whole shoot. Still photos only and I'd shoot both raw (~12 meg) and high-quality JPGs (~5 meg) on each shot. This gig would likely lead to future gigs using different girls. Model, props, and misc. would total about $200 for a 3-hour shoot. I'd shoot about an estimated 200 photos, with plenty of variety. I would deliver the photos on a thumb drive or via the web. And he'd probably pay me via PayPal. I'd appreciate any suggestions on what to quote him. Also would appreciate any other comments or advice. What makes you think you will be paid? I suggest you get a cash retainer. This type of computation drives a friend of mine crazy, and he refuses to accept the correct answer. Multiplication and division is always done before addition and subtraction. Would you consider both these Pics to be photographs? Art is in the eyes of the beholder, no need to be rude. I think ricardo7 is just being honest. I get sick of the benign comments on here about peoples' terrible pictures. People say "Great job" "I like it", etc. When they are really talking about a terrible shot. It doesn't do anybody any good to give these good comments on crappy pictures. It just makes them think they are good photographers when they are really pathetic. I think being honest is really what we need here, instead of stroking everyone's ego. I posted on this yesterday but my post may have been confusing - it's a very complicated area for me (sorry I don't know how to paste the topic link in here). I've had stories published (with Nikon 1 pics) but only in Yacht Club magazines. I need better photos for some sailing & travel magazines interested in the voyage & the reason for it. So I now have a D7200 but no telephoto lens. There will be amazing wildlife up in the Alaska section, but a sailboat also cannot often get close to wildlife & there can often be poor light. So I figure I need a telephoto lens. But which? I'm small (& not a teenager) & would struggle with a heavy lens, especially on a moving sailboat. I'm not a wealthy "yachtie" so for instance I could not afford the new Nikon 200-500 even if I could get one. Used (unless a hogger has something for sale) is not ideal as I'm leaving the US soon, so re-furb or new. I've read many many posts & articles on the topic, but it would be nuts to spend thousands without knowing what I'm doing & why. Does anyone have any thoughts on how they might go in similar circumstances? Get the Tamron 70-200mm G2 lens. It's fantastic. Very Sharp. I use it on my Nikon D500 for baseball. How can an 8 bit image be transformed into a 16 bit image and called 'raw'???? A raw file is a sensor capture with minimal processing. A JPG is a (camera) processed image WITH lossy compression. Ron, just because you don't know how it's done does not mean it can't be done. I didn't believe one could capture a perfectly good television image from a snowy picture either. But with DSP, it's possible. No, you can have both buttons focusing. I have my shutter button disconnected from focusing because I didn't want to be tempted to go back to having it focus. How "professional"? I use Costco and am very pleased. I use Nations Photo Lab. They frequently have sales on various size prints. When on sale a 16" x 20" is $7.00. They are great about remaking the print if you are not satisfied. MPIX is also a very good lab. So is AdoramaPix. I usually download the ROES software and when I need something printed, just upload the image to them. Easy-peazy. Lava Lake , south of Mt. Bachelor , West of Sunriver OR. this is the head waters of the Deschutes river. I'm curious. Did you do this with one image in camera HDR or did you put 3 shots together in Photoshop, or did you just increase contrast and saturation?